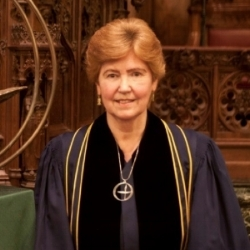 The Reverend Ann C. Fox, a former native of the UK, is Minister Emerita of Unitarian Memorial Church, Fairhaven, MA. She holds a Master of English Education from the City University of New York and a Master of Divinity from Boston University School of Theology. She has two adult children in California and the Netherlands and two grandchildren. She lives with her husband in Dartmouth, Massachusetts.